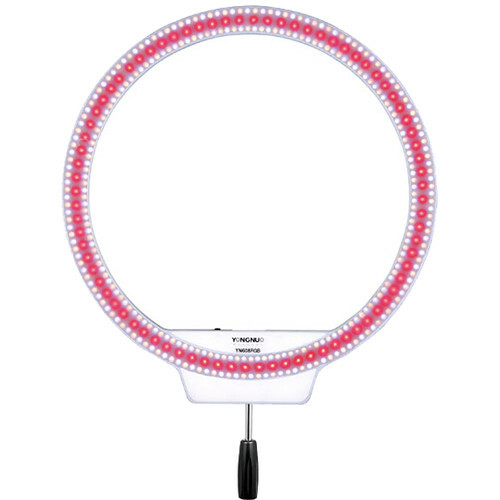 The 19.6" diameter YN608 RGB Bi-Color LED Wireless Ring Light from Yongnuo features a distinctive-shaped light fixture with a variable color temperature output from 3200 to 5500K employing 304 LEDs. It also has 80 SMD RGB LEDs for fine tuning and creating just about any color you want while maintaining a CRI of 94, indicating a precise and faithful rendition of color. The YN608's functions can be controlled on the fixture but also at a distance with the included wireless remote control. YN608 RGB's unique shape produces a signature quality of near shadowless light that is very flattering to skin tones, makeup and fashion in general and produces attention-grabbing circular catchlights reflected in the eyes of the subject. The ring light outputs a wide 55-degree beam angle that can be further widened to 110-degrees with the included diffuser. The fixture can be powered using an AC adapter (not included), or by two separately purchased Sony-type NP-F750 series batteries when AC current is unavailable. Box Dimensions (LxWxH) 20.8 x 20.6 x 2.0"